Barbara Weissberger’s work is shown at such venues as The Drawing Center, White Columns, PS1/MoMA, Gridspace (Brooklyn), Photoville (Brooklyn), and Hallwalls (Buffalo) in New York; Coop Gallery, Nashville; Big Medium, Austin; The Mattress Factroy, SPACE Gallery and the Pittsburgh Center for the Arts, Pittsburgh; GRIN (Aldrich + Weissberger), Providence, RI; Artspace New Haven, Connecticut; ADA Gallery, Richmond, VA; and The Holter Museum of Art , Montana. She was a participant in The Drawing Center’s inaugural Open Sessions, and a Guggenheim Fellow. Residencies include Yaddo, MacDowell Colony, Camargo Foundation (France), Ucross, Ragdale, Hambidge Center, The Virginia Center for the Creative Arts and the Montana Artists Refuge. In addition she makes collaborative installations with the artist Eleanor Aldrich. Eleanor Aldrich was born in Springerville, Arizona. A participant at the Skowhegan School of Painting and Sculpture in Maine, she also holds an MFA in Painting & Drawing from the University of Tennessee, Knoxville, where she currently lives. She earned her BFA in Painting & Drawing through the Academie Minerva (Groningen, the Netherlands) and Northern Arizona University, Flagstaff. She was a participant in the Drawing Center’s first Open Sessions.Eleanor has had solo shows in Boston, Nashville, Knoxville, Flagstaff, AZ, and at the University of Alabama. Her work has been shown at Saltworks Gallery (Atlanta, GA), the Drawing Center (New York, NY), Grin (Providence, RI) and Ortega y Gasset (New York, NY). Her work was chosen for 1708 Gallery’s ‘FEED 2013’ (Richmond, VA). She has been awarded an Endowment for the Arts through the Whiteman Foundation, and the Herman E. Spivey Fellowship. Her work has been included in New American Paintings and on Artforum.com. Born in Nebraska, Erin Belieu earned an MA from Boston University and an MFA from Ohio State University. Belieu’s work focuses on gender, love, and history, filtering wide-ranging subject matter through a variety of theoretical frameworks. She often addresses feminist issues and uses poetic conventions and street talk. Belieu is the author of four books of poetry: Infanta (1995), selected by Hayden Carruth for the National Poetry Series; One Above, One Below (2000); Black Box (2006), a finalist for the Los Angeles Times Book Prize; and Slant Six (2014). Belieu coedited, with Susan Aizenberg, the anthology The Extraordinary Tide: New Poetry by American Women (2001). With poet Cate Marvin, Belieu cofounded and codirects VIDA: Women in the Literary Arts, an organization that seeks to “explore critical and cultural perceptions of writing by women” in contemporary culture. Belieu has taught at Washington University, Boston University, Kenyon College, and Ohio University, and was formerly former managing editor of AGNI. 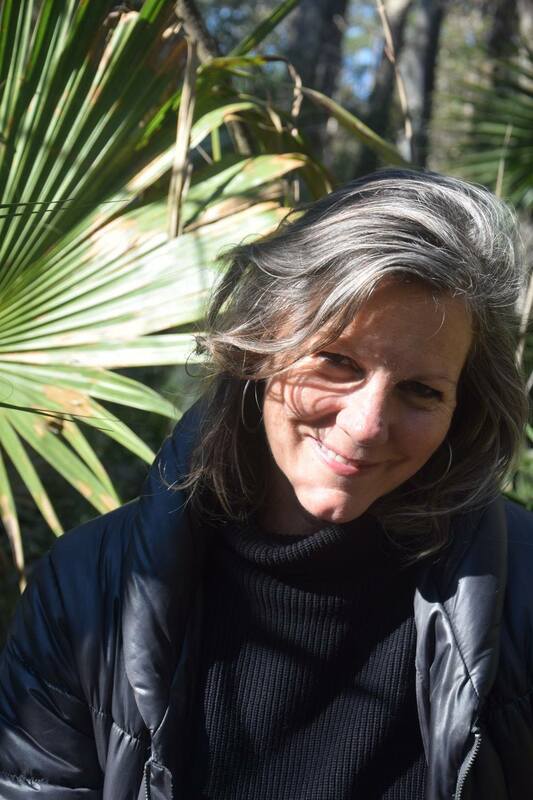 She is director of the creative writing program at Florida State University and artistic director of the Port Townsend Writers' Conference. Belieu is working on a memoir about raising a child with special needs. Judy Rushin’s work has been seen by people in museums, galleries, front yards, and other alternative viewing environments across the US. Recent exhibitions include The Ringling Museum of Art, The Ulrich Museum, The Orlando Museum of Art, Alexander Brest Museum, Terrain Projects (Chicago), CoLab Projects (Austin) and Flashpoint Gallery (DC). Her projects vvvvv and Comma are in eleven collections including Vanderbilt University, University of Wisconson, Miami University, MassArt, Baylor University, University of Washington, University of Southern California, Cal Poly University, and University of Utah. Her project ViV traveled to individuals who engaged her paintings on their own terms and turf, and sent them back bearing the imprint of the places they had been. She has been featured in Burnaway, Modern Art Notes, The Washington Post, and has completed residencies at MASS MoCA, Virginia Center for the Creative Arts, and Hambidge Center. Carolyn Henne’s sculpture is largely informed by anatomical studies – from simple school-house diagrams to NIH’s Visual Human Project. Her work ranges from large, complex interactive installations and performances to more straightforward, discrete objects. Suspended Self Portrait is in the permanent collection at the National Museum of Health and Medicine and was featured in the NIH’s exhibition and book, Dream Anatomy. Henne was part of a team of arts, engineering, and business students and faculty working with VCU surgeons to develop a prototype for a life-like surgical trainer. Subsequently, she collaborated with surgeons to develop prototypes now being replicated and employed to train surgical students and shared at workshops internationally. She has a Courtesy Faculty Appointment with FSU’s College of Medicine.